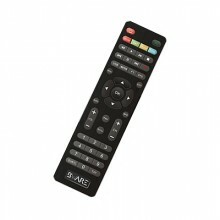 Original replacement remote control for use with your BWare RX540EV set top box. This handy remote control allows easy control by clearly arranged buttons a fast and convenient access to all functions of your device. Suitable for the BWare RX540EV range of digital satellite receivers. It is NOT compatible with other BWare set top boxes. Click the button below to add the BWare RX540EV Original Replacement Remote to your wish list.